Growing garlic from true seed can be surprisingly difficult. Even discussing the process of growing garlic from seed is difficult — much less actually doing it — as terms overlap and are sometimes used incorrectly. The first obstacle is that many growers market and sell “seed garlic”, which are usually full bulbs of different types of gourmet and heirloom garlic. The “seed” in “seed garlic” doesn’t refer to an actual seed but is meant to convey that you’re buying garlic to start growing your own, with it serving as your seed stock. Seed garlic comes in bulbs which you break up into cloves and plant. Each clove will produce a plant that is genetically identical to its parent. 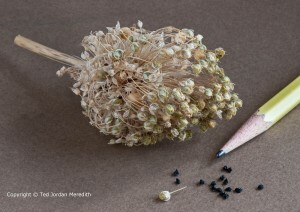 A photo from garlic author and grower Ted Jordan Meredith highlighting garlic seeds in the bottom right. Photo copyright Ted Jordan Meredith. Garlic can reproduce in three ways — from its cloves, from bulbils that it produces in its umbel, and through seeds that develop in ovaries located in the umbel. Over time garlic has evolved and drifted away from reproducing by true seeds, with cloves and bulbils its preferred method to propagate itself. That drift has become so pronounced that without some help, the vast majority of garlic varieties today are actually incapable of reproducing via seed in the wild. That’s both good and bad news for garlic growers. The good news is that it is now very easy to grow garlic from cloves but the downside is that there is far less genetic diversity than if garlic still propagated via seed. New garlic varieties can only come about via spontaneous mutations and hybrids bred for the best traits of different garlic types can’t be created, as each planted clove is simply a clone of its parent. Growers have had some success in re-training certain garlic types to reproduce via seed. Growing Garlic from True Seed is the best resource that describes the process, and there is an ongoing thread at Seedsaver Exchange devoted to efforts to grow garlic from true seed. Growing garlic from seed is difficult and not a viable way to get started when growing garlic but it can be an interesting and important hobby once you’re up and running and growing garlic.